United Colors of Benetton ventured into controversial territory in 1991 with the publication of “Pieta”, a photographic expose of the reality of AIDS. 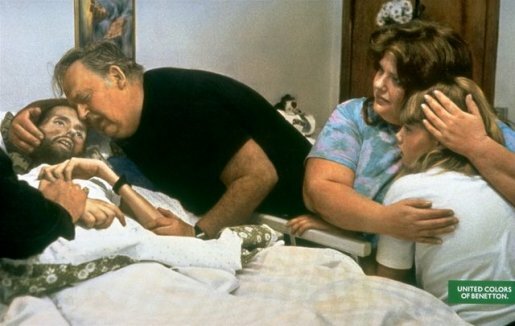 The photo of AIDS activist David Kirby was taken in his room in the Ohio State University Hospital in May 1990, with his father, sister and niece at his bedside. The photo was taken by Therese Frare. 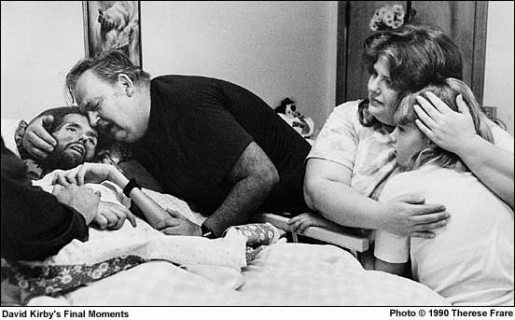 Frare included the black and white photograph in a photographic documentary on the lives of clients and caregivers in a hospice for people with AIDS. The photograph was included in LIFE magazine in November 1990, and went on to win the 1991 World Press Photo Award. Tibor Kalman, working with Oliviero Toscani, was preparing a consciousness-raising campaign associated with Benetton products and culture. He saw the Frare photograph in Life Magazine and suggested that Benetton include it in their advertising campaign. Benetton approached the photographer and Kirby family, gaining consent for the use of the photograph and contributing to an AIDS foundation. When considering whether to stay with black and white or go with color the creative team decided that it needed to look like an advertisement, raising the shock value. 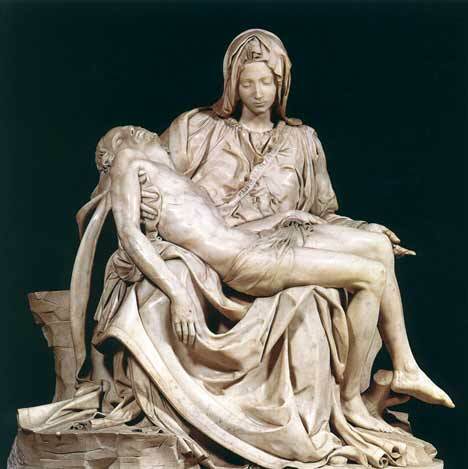 The ‘Pieta’ ad certainly had an effect. On one hand the advertisement won the European Art Director Club award for the best 1991 campaign and the Houston International Center of Photography’s Infinity Award. The print was exhibited in American, French, Italian, Swiss and German museums. In 2003 the photo was included in the Life magazine collection ‘100 Photos that changed the world’. There were many negative reactions however. A number of AIDS activists believed that the photograph and its use in advertising actually painted AIDS victims in a negative light, spreading fear rather than acceptance. Others perceived the campaign as a vindication of homosexuality. For some there was sensitivity about the implied connection between the deaths of David Kirby and Jesus.